Mssrs. KITE and HENDERSON, in announcing the following Entertainments, assure the Public that this Night’s Production will be one of the most splendid ever produced in this town, having been some days in preparation. “Mr. J. Henderson” was John Henderson, a wire-walker, equestrian, trampoline artist, and clown. While the poster made no mention of “Hendersons” plural, as Lennon sings, John Henderson did perform with his wife Agnes, the daughter of circus owner Henry Hengler. The Hendersons performed throughout Europe and Russia during the 1840s and 1850s. A hogshead is a large wooden cask. One of the most musically complex songs on Sgt. Pepper, it was recorded by the Beatles on 17 February 1967 with overdubs on 20 February (organ sound effects), 28 March (harmonica, organ, guitar), 29 March (more organ sound effects), and 31 March. Lennon wanted the track to have a “carnival atmosphere“, and told producer George Martin that he wanted “to smell the sawdust on the floor.” In the middle eight bars, multiple recordings of fairground organs and calliope music were spliced together to attempt to produce this request. In a 1968 interview, Martin recalled that he achieved “this by playing the Hammond organ myself and speeding it up.” After a great deal of unsuccessful experimentation, Martin instructed recording engineer Geoff Emerick to chop the tape into pieces with scissors, throw them up in the air, and re-assemble them at random. Before the start of the first take, Lennon sings the words “For the benefit of Mr. Kite!” in a joke accent, then Emerick announces, “For the Benefit of Mr. Kite! This is take 1.” Lennon immediately responds, “Being for the Benefit of Mr. Kite!“, reinforcing his title preference from a phrase lifted intact from the original Pablo Fanque poster. The exchange is recorded in The Beatles Recording Sessions (slightly misquoted) and audible on track 8 of disc 2 of Anthology 2. The original recording can also be heard during the loading screen for the song if it is downloaded in the video game The Beatles: Rock Band. 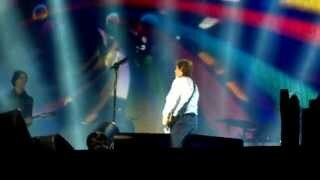 Paul McCartney performed the song live for the first time by any Beatle on 4 May 2013 at the Estádio Mineirão, Belo Horizonte, Brazil and throughout his 2013–2015 Out There! Tour. 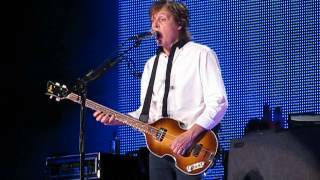 Additionally, McCartney performed the song live on the Colbert Report on June 12, 2013 as well as during his One on One tour in 2016. Mono [a] has more of the organ tape loops in the break after “Henry the horse dances the waltz”, perhaps a track not faded up in the mix of [b]? 3:22 • Studio version	• E • As the title suggests, the track contains the whole of "Being For the Benefit of Mr. Kite", the guitars from "I Want You (She's So Heavy)" and heavily delayed vocals from "Helter Skelter". This track also contains horse sounds from "Good Morning, Good Morning", harmonium and other elements from "Cry Baby Cry" and laughter from "Piggies". “Being For The Benefit of Mr. Kite!” has been played in 194 concerts and 5 soundchecks.